I now want to escape Canada and live in L.A and you won't stop me. 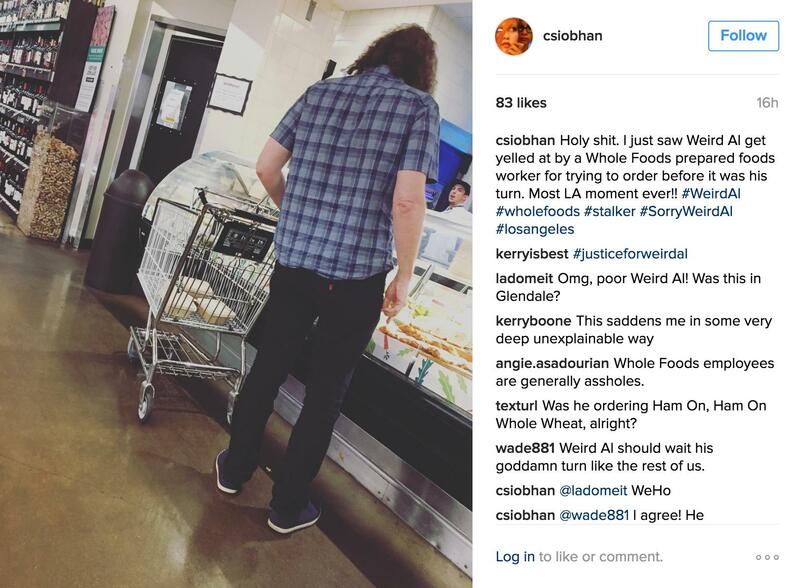 I WANNA SEE WEIRD AL GET YELLED AT AT A WHOLE FOODS, ONLY FOR ME TO DEFEND HIM AND YELL AT THE LADY BEHIND THE COUNTER BACK!!! Man Al must not have noticed the clerk was on a cell phone call with his mother. Didnt he see his index finger? Who does that jerk think he is?! How could anyone yell at Al!? crazygurl14 wrote: Who does that jerk think he is?! How could anyone yell at Al!? Yeah, where have you been? Family pic at the captain underpants premiere. Holy cow, Nina is quite tall now. TMBJon wrote: Holy cow, Nina is quite tall now. To be fair, Al IS quite tall himself - 6'0". It IS surprising to me how, at the ripe age of 13, she IS THAT TALL. I don't even remember my exact height, for heaven's sake. I will be starting my son off early!!! !